Tata is one of the biggest automotive brands in India but is barely known elsewhere. One of its biggest claims to fame is the launch of the world’s cheapest car, the Nano, back in 2009. Tata knows it will need world-class vehicles if it is to be recognized on the world stage, so it recently partnered with its Jaguar Land Rover subsidiary to develop an advanced modular platform. Called OMEGA, an acronym for Optimal Modular Efficient Global Advanced, the platform is flexible enough to spawn everything from compact sedans and hatchbacks to SUVs and even electric cars. Tata used last month’s 2018 Auto Expo in Delhi to present the OMEGA-based H5X SUV and 45X hatchback concepts. At this week’s 2018 Geneva International Motor Show, Tata presented an OMEGA-based electric sedan concept, the E-Vision. And yes that’s Bernie Ecclestone looking on in one of the shots. Tata is short on details but says the E-Vision is capable of 0-62 mph acceleration in under 7.0 seconds and a top speed of 124 mph. The company also says the concept is packed with the latest technologies in the areas of charging and electric driver aids with self-driving capability. The first of Tata’s new models based on the OMEGA platform is expected to be launched in India in 2019. It will likely be a production version of the H5X SUV concept. 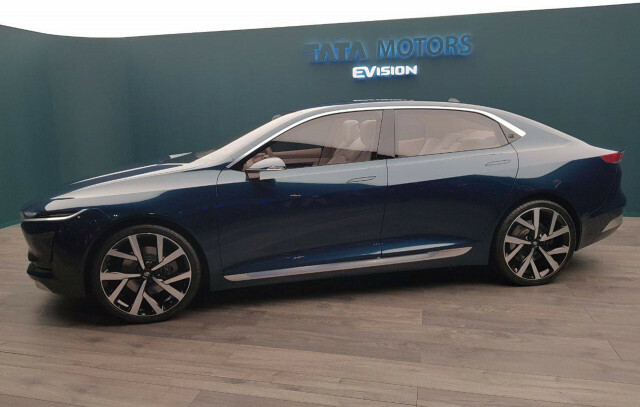 Tata is also likely to launch a production version of the E-Vision in the following years, but with conventional powertrains initially. ‹ Previous Final Fantasy XV Windows Edition PC Performance Review – The Best Way to Play FFXV? Why Is Apple Acquiring RealFace AI From Israel?